Want to reduce travel stress? Take along a custom Travel Pillow by Royal Pillow. We offer you the ability to travel with the same comfort you enjoy on your bed pillow at home. Why trust your ability to rest to a generic one-size-fits-all travel pillow or worse yet, one that you have to blow up yourself? And since when has resting your head on a ‘balloon’ been comfortable? When you order your TRAVEL PILLOW at Royal Pillow (at factory direct wholesale pricing) you choose the firmness and we also give you many choices when it comes to your travel pillow case, again, all at our low factory direct wholesale price! As with all our pillows, you have many choices as to your pillow’s fill material. From our Ultra Luxurious 100% Premium Hungarian Goose Down Travel Pillow to our Down and Feather blends and Polyester Down-like fiber filled travel pillow. Travel pillows come covered with 200 and 308 thread-count down-proof ticking. 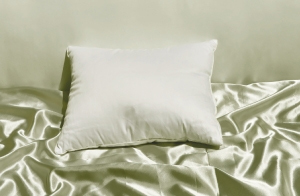 The 308, Combed Cotton fabric used in the 600 , 700 , and 800 down pillows, has an exquisite finish and shine, giving these pillows a great feel. 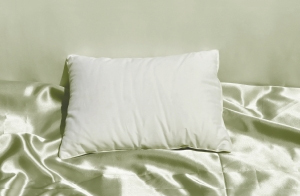 We manufacture a SMALL travel pillow at 12″ x 16″ and the LARGE travel pillow at 16″ x 20″ . These travel pillows are great for your car, SUV and RV, and are a real GOD send when going on trips; planes, trains, or buses. Small children love them (dogs like them too) and these very cute pillows also make for nice throw pillows when not in use. Filled with 10% down and 90% feathers. The cover is a 200 thread count, white down proof ticking. This blend also has smaller feathers and an even a higher percentage of pure down in the blend. The cover is a 200 thread count, white down proof ticking, well filled. These travel pillows are filled with 100% White Goose Down, 600+ fill power, and with the 308 tc cover. The 308, Combed Cotton fabric has had all the short fibers ‘combed’ out of it leaving only the longest fibers making for a softer and stronger fabric. The 308 has an exquisite finish and shine, giving the pillows a great feel.